America’s energy future is at a crossroads. Everyone can agree that we must reduce our dependence on foreign oil while strengthening our economy and creating jobs. But how do we get there? One path at first appears to be a shortcut: Exploiting our natural resources and drilling our way to an energy-independent future. But it’s a deceptive path, which disregards the long-term implications for our landscapes, environment, security, and economy. The alternative is a longer but more realistic path, one that continues to diversify and strengthen the economy through proactive solutions that move us toward sustainable energy independence and create the jobs of the future. In that first vision—brought to us in ads, policy briefs, and conferences funded by billion-dollar energy companies—America is a land of fossil-fuel extraction, where every region makes its own contribution to a drilling-intensive future. Fossil fuel interests have spent an estimated $153 million in this year alone promoting fossil fuels and attacking clean energy industries, but perhaps the best articulation of this “drill baby drill” vision comes from the American Petroleum Institute, the oil and gas industry’s trade association. Its recent platform proposal to the Republican and Democratic party platform committees advocates drilling for oil offshore, for oil and gas onshore, for coal mining in general, and for building pipelines to transport all these dirty fossil fuels around the country. The industry institute applies this same backward-looking strategy to every region of the country, regardless of whether it’s the most effective method. It is clear that this strategy enhances the profitability of big oil companies. But it’s much less clear that it enhances the interests of the American people. And ultimately, it’s a mirage. The United States cannot achieve lasting energy and economic security through resource extraction alone. An energy plan based solely on drilling and mining for more and harder-to-reach fossil fuels squanders the opportunity to diversify and strengthen our economy, threatens our nation’s ability to lead in the global marketplace, and completely ignores the urgent need to combat climate change and reduce our dependence on fossil fuels. Furthermore, it dismisses the significant growth of the clean economy, a diverse set of industries that employs some 3.1 million Americans. In Washington, however, clean energy solutions have become highly politicized, due in no small part to aggressive lobbying by the fossil fuel industries. The relentless public relations campaign by conservatives to deride the fossil fuel causes of global warming clearly is paying off. The endless drumbeat of conservatives in Congress bashing the high-visibility—but quite rare—public investment failures such as the solar company Solyndra enables them to argue that renewable technologies don’t work, and that any government action to promote them has no place in public policy. But this rhetoric is more than just false: It also denies the success of clean energy at the local level, often in the very states and districts from which these congressional naysayers hail. According to a new report, 7 of the 17 states with the fastest-growing green jobs numbers are swing states or “red states” (Republican-leaning in the lexicon of the political scientist)—and red states lead the top 10 states with the largest share of green jobs as a percentage of total jobs. The top three states in that category feature more clean-tech workers than the entire U.S. coal mining sector. This politicization of energy has real-world consequences. Although investments in clean and sustainable energy systems have underpinned economic growth across America, political support for renewable energy, energy efficiency, and critical environmental protections is declining precipitously. Even policies that were originally enacted with bipartisan support have become almost impossible to move through Congress. Just one case in point: The production tax credit for wind energy is set to expire at the end of this year due to congressional inaction, even though both the House of Representatives and the Senate have introduced bipartisan bills during this session to extend the credit. Letters of support have poured into Congress from businesses across the country, yet political gridlock means project developers can’t get financing to put turbines in the ground, and turbine and tower manufacturers can’t count on new orders coming into their factories. Altogether, letting the production tax credit expire means that 37,000 Americans working in the wind energy sector will probably lose their jobs by early 2013—and that’s just one energy policy for one energy sector. It’s not only renewable energy development projects that are on the chopping block. If passed by Congress and signed into law, the House appropriations bill for energy and water programs for fiscal year 2013 would slash funding for the Department of Energy’s overall research and development programs by 11.6 percent, undermining efforts by our national labs and universities to discover and commercialize the low-carbon technologies of the future. When even relatively uncontroversial programs such as early-stage research and development are under fire, we know the politics of energy have changed for the worse. Paradoxically, though, the actual economics of energy have changed for the better. We’ve seen significant technological advancement in both fossil fuel development and in renewable and efficient energy solutions. Just a few short years ago, we couldn’t have dreamed of the vast shale oil-and-gas resources that would be opened up by new drilling and hydraulic fracturing, or “fracking.” We couldn’t have imagined the declining rate of coal as a percentage of our nation’s electricity mix as a result of these discoveries. We couldn’t have known that solar energy would have nearly achieved cost parity with more traditional forms of energy. And we couldn’t have predicted the meteoric advance of new vehicle technologies that would dramatically reduce our carbon footprint in the transportation sector because of dropping demand for gasoline. In the face of all this political dissention and technological upheaval, the question remains: What is America’s energy future? This paper does not disregard the role of fossil fuels in the U.S. economy. It instead looks beyond the finite contributions that fossil fuels can ultimately make to our nation’s energy security and economic prosperity. It also challenges the idea that fossil fuels provide a one-size-fits-all answer to America’s energy needs. Every region of our nation has its own intrinsic resources and can contribute in its own way toward the overall movement away from a carbon-only energy future. This paper recognizes the inherently regional nature of energy and sustainability. In contrast, the vision for America presented by the American Petroleum Institute and its supporters in Washington and across the country embraces a “drill-here, drill-now” agenda without regard to the long-term economic and environmental consequences or to the specific needs of America’s diverse regional economies. It ultimately is a shortsighted strategy that will not work. Diversifying away from these fossil fuels is an urgent and essential step to ensuring our long-term climate stability and economic competitiveness. Organizations and individuals intimately familiar with each region have contributed chapters that identify core strategies that will make that region more resilient to the impacts of climate change, while also creating jobs and economic growth. These energy and resiliency strategies mostly take the form of regional approaches to create low-carbon or no-carbon electricity or fuel to serve each part of the country. For the Gulf Coast, however, the author focuses on the critical need to restore economically important coastal wetlands, which provide vital ecosystem services as storm surge buffers, pollution filtration systems, and fisheries nurseries. This report will show that this region, which has been paying the price for decades of oil-and-gas drilling and refining, can transition away from extraction to diversify and strengthen its economy. Although the authors tried to be as inclusive as possible, they haven’t addressed every region of the country. Nor have they identified every possible energy generation or resiliency solution for each region. 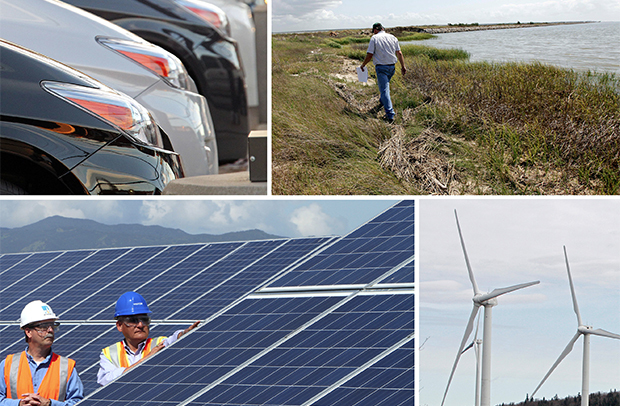 Though the clean energy economy for each state and region is multifaceted, this report highlights specific projects that are currently in operation or that have proven and achievable potential to create significant jobs and sustainable industrial development. These regions and strategies were chosen to expose a choice fundamentally critical for the future of the country and the planet. The path offered by the American Petroleum Institute and its supporters leads to a dead end—finite resources expended in blind disregard to environmental consequences. The solutions presented in this report point to a different road—one that highlights clean energy and stewardship as economic drivers that are as powerful as the fossil-fuel industry, one that is available today and sustainable for tomorrow, and that bends us away from our current trajectory of global climate change and self-destruction. This is a vision that is uniquely American. One of this country’s greatest strengths throughout its history has been its huge size and resource diversity, and by capitalizing on the unique strengths of each region, we can harness this diversity to move toward a brighter economic and energy future. Kate Gordon is the director of advanced energy and sustainability at The Center for the Next Generation in California, as well as a Senior Fellow at the Center for American Progress. Kiley Kroh is the Associate Director for Ocean Communications at the Center.